Textiles and Human Thermophysiological Comfort in the Indoor Environment provides a valuable reference for students and researchers working in the area of clothing comfort. Radostina A. Angelova holds an M.Sc in textiles and clothing (1994), a Ph.D in technology of textile materials (2001), and a D.Sc in technology of textile materials (2015). She is currently an associated professor in the Department of Textiles and an associate researcher in the Centre for Research and Design in Human Comfort, Energy, and Environment (CERDECEN) at the Technical University of Sofia, Bulgaria. Dr. Angelova lectures on spinning technologies and machines, weaving technologies and machines, and the design of yarns and fabrics. She has authored five books and more than 100 papers. "… a very comprehensive textbook that covers the interactions between humans, clothing, and the environment. The fundamentals of heat transfer modes, roles of textile mesostructures and macrostructures on heat transfer and air permeability, and modeling methodologies are covered in adequate depth. … an excellent source of knowledge for students and researchers working in the area of clothing comfort." 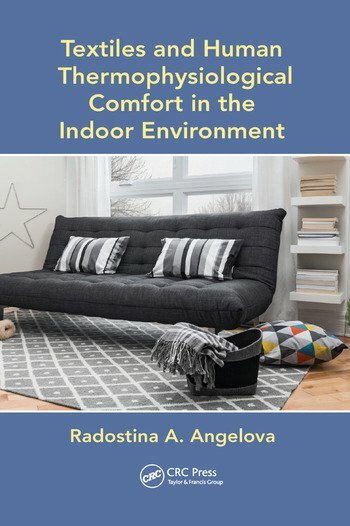 "… a very good systematic study about all the topics related to thermophysiological comfort in the indoor environment. … gives the fundamentals and enough experimental data, which can be used directly by researchers and students, as well as enough methods for numerical and experimental investigations for optimizing textiles."